Finally a fun and easy way to rig your characters in seconds instead of minutes of tedious work! – Instead of traditional scaling/rotating/moving joints to fit your model. Very easy, fast, and fun! Pick your character model and then have fun just selectin the points as indicated, that’s it! No boring and tedious manual placements of joints. After that you can fine adjust if needed. Generate the Skin weights to only the joints you need with 1 click instead of selecting manually the joints that will affect the object. Select the objects you want to attach and just click the body part in the dedicated interface to constraint them! Experimental new feature to automatically generate “look-at” controls for your character’s eyes, just select the 2 eyeballs and done. Just rig+skin in seconds! Literally you can give life to your model in LESS than 1 or 2 minutes! 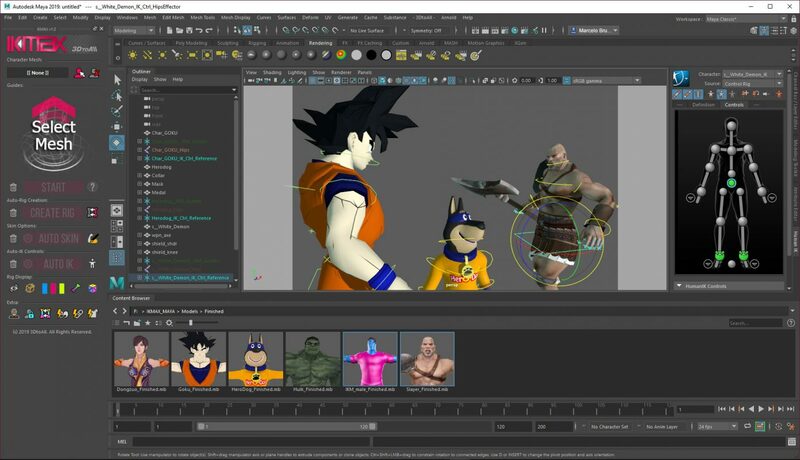 After you finish rigging your character you can group all the scene and place it in the Maya Content Browser to re-use later in other scenes! Have fun rigging your characters, make a cool pose for an illustration or an epic animation! And this is just the beginning, we’ll keep working hard to improve and add more cool features thanks to you, 3D amigo! You have 24hs to test when you get the product and if not happy we’ll return your money back – no questions asked! Download Now! You Just Pay $29 instead of $45!